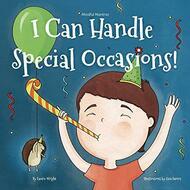 Can your children handle special occasions? Of course they can, with the help of a mindful mantra! They can handle watching others open presents, a crowd of people at their houses and they can even handle eating unfamiliar food! Chances are, whatever a special occasion has to throw at kids, they can handle it, with a little bit of coaching from you. Help your child or students handle the range of emotions that accompany special occasions, and provide a coping tool to last their lifetimes. Emotions are tricky and hard to handle when you’re small, and kids need our help! Mindful Mantras equip children with a necessary skill in order to cope with worries that arise during special occasions, like birthdays, family gatherings, school holidays, Christmas or Halloween. Teacher and parents have the most difficult and important jobs, and to help you out sign up for free resources! Simply go to www.bit.ly/LaurieWright2 to get them!